Now, that's a lot of 'information' falling through the cracks when we have taken the time and energy to learn something. 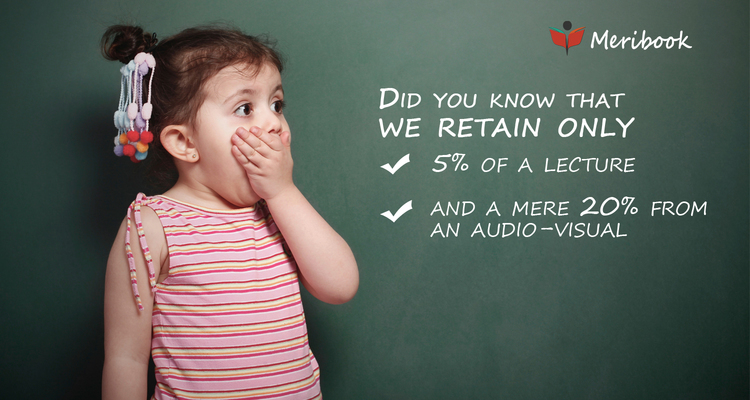 We retain only 5% of a lecture and a mere 20% from an audio-visual... That's awful! Fix this issue of losing "learned" information! What that means is, there is "big hole" up there, not a leak... A big hole... 80% Big! Before we spend more time and money to learn something new, we should fix it, don't you agree? It' very important you see this 80% Big Hole "up there". You have a choice of taking a car that gives awful mileage and one that runs on electricity. Your most valuable resource is TIME! Time! is being "wasted" when "spent on learning"! That's like burning rubber in your gas guzzler. Do You Want To Do That With "Your" Time? Time... Something that cannot be replaced even if you had unlimited money. Still every day we spend hours "learning new stuff" and keep only 5-20% of what we wanted to learn. In 1960 the National Training Laboratories Institute for Applied Behavioral Science in the US did some research on how we learn and retain information. They came up with a concept called the "Learning Pyramid". Too bad they don't teach this in school. While some argue that this research is not conclusive and there are other factors involved, common sense tells us that it makes sense. But, why do you retain 90% of what you learned, when you "teach or implement" what you learned? This making of mistakes, while "teaching or implementing" forces you to pay more attention and obviously this helps you retain more of what you learned. So, why aren't we in "general"..."teaching" and "implementing" more? Which then makes you expert in everything you do. To take your notes when you are learning. To fix these notes... as you "implement" them. A 'refined' set of notes. Which gives you the confidence to 'teach' others. Which in turn means, you have learned that information effectively and are retaining a lot more than 20%. So, what are some "note taking systems" we have in place? To retain more of what we learn! Then you have to have your "own system" on how to take good notes and organize them in a way where they are available to you 'fast' when needed. For me, since I am online all the time type of person, my note taking tool is obviously a software. Actually, we designed our own "note taking/learning" software. Easy To Teach, Easy To Implement! We didn't know about "this research" when we started the project. YOU NEED TO TEACH SOMEONE! OR, YOU USE IT IMMEDIATELY! With Meribook, It's Simple And Easy. Without a "system to organize our information," we would run out of gas If we pick the wrong vehicle. Get in the "best optimized" vehicle for "note taking" or Not! It has helped me personally as a knowledge worker to be more productive. It's free, so you can try and see if it works for you! Sign Up For Free Meribook Account! ALAUDDIN AHMED WROTE this on Nov 04 There are 3 COMMENTS.